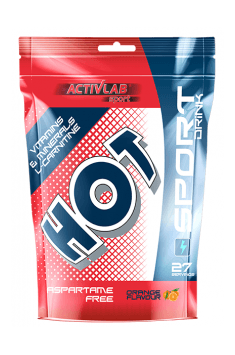 Activlab HOT is a carefully designed concentrate for a convenient preparation of an isotonic drink. The preparation contains a mixture of simple carbohydrates, enriched with a package of electrolytes, vitamins, and minerals. For even better performance, the product has been supplemented with L-carnitine, which promotes the increase of endurance and promotes fat burning. The product is designed for athletes. It is used in peri-training periods, that is before, during and after an intense physical workout. Based on concentrate, the drink obtained has a pleasant, refreshing taste. It provides much better hydration than regular water, instantly rebuilds losses in electrolytes and boosts with energy. It helps to increase endurance and can significantly delay the occurrence of fatigue signs. Carbohydrates that secure body's energy needs. The producer of the product focused on two carbohydrates sources – glucose and maltodextrin added to the product’s composition. Their glycemic index is high and their digestibility very comparable. They are an excellent source of easily accessible energy for the body, instantly replenish muscle with glycogen and facilitate the transport of creatine and valuable nutrients to the muscle cells. Yet, they do not burden the stomach and cause no problems for the digestive system, which usually deals with digestion worse during an intensive workout. Electrolytes combine aqueous solutions of sodium, chloride and potassium ions. They regulate nervous and muscular systems, balance blood pressure and maintain a proper acid-base balance in the body. They are also responsible for the absorption and distribution of water in the body. An intensive and long-lasting workout causes large losses of electrolytes that are excreted from the body along with the sweat. If this level is not compensated, an electrolyte imbalance may occur, which has serious health consequences. Selection of vitamins supplying the body with valuable vitamins, demand for which grows with an intense, sporty lifestyle. They favorably affect the psychophysical condition and ensure the correct course of all the most important biochemical processes taking place in the body. The selection includes such vitamins as: vitamin A (involved in the process of seeing and synthesis of important hormones), vitamin C (supports collagen synthesis, boosts the immune system, reduces excess cortisol); Vitamin E (one of the strongest antioxidants, fights with the excess of free radicals that occur during intense physical exercise); vitamins D and K (they optimize the calcium and phosphate metabolism, have a positive effect on the condition of the osteoarticular system); B vitamins (necessary for the nervous system and the proper functioning of metabolic processes). The mineral complex provides two elements functioning synergistically which cannot be missed in the athlete's diet. These are calcium and magnesium. They are responsible for the transmission of nerve impulses, enable the proper functioning of muscles, and they are also the building blocks of bone tissue. Deficiencies of either reduce the efficiency of energy production processes and disrupt the functions of the muscular system. This, in turn, results in quicker fatigability, lack of energy and strength. With a large deficit, there may also occur painful muscle cramps. L-carnitine is a vitamin-derived substance that promotes the use of fats as a source of energy in the body. It transfers fatty acids to the mitochondria, where they are oxidized and burnt. This process generates the energy necessary for life. This way, L-carnitine not only promotes the improvement of physical performance but also accelerates the rate of fat burning. In summary, Activlab HOT is a tasty sports drink that effectively quenches thirst, perfectly hydrates and rebuilds the reserves of valuable nutrients lost during an intense physical exercise. It ideally replaces water, contributes to the increase of physical capabilities of the body and enables the performance of even the most demanding workouts. Dissolve 1 measure (37 g) in 500 ml of water or dissolve 15 g in 200 ml of water. Before physical effort – about 500 ml of fluid (1 hour before training). During physical effort – about 1000 ml for each hour of training. After physical effort – more than 500 ml of fluid (2 hours after training). The concentrate is used to prepare an isotonic drink. Designed for athletes, the product can also be used by people performing heavy physical work. It perfectly replaces water, provides the body with better hydration. The first portion of the preparation (one scoop dissolved in 500 ml of water) should be taken before the planned physical exercise. Next portions to drink during training. For every hour of intense physical exercise a portion of 1000 ml of liquid with 2 dissolved scoops of powder should be taken. In order to restore glycogen losses and replenish electrolytes, another portion (one scoop dissolved in 500 ml of water) should be drunk within 2 hours from the end of training. For even better results, the product can be combined, e.g. with creatine. Maltodextrin, Glucose, Acidity regulator: citric acid, Flavorings, Sweeteners (E9500, dyes: E104 (Lemon, Grapefruit, Orange Flavor), E110 (Orange Flavor), E24 (Cherry Flavor), E162 (Grapefruit Flavor).